Work completed this week for the Jurys Inns group of hotels. The team at Glasgow Creative have had another busy week producing a wide range of marketing collateral for our customers. For one job in particular we completed a large order of Leaflets, Roller Banners and Raffle Tickets for use across 35 of the Jurys Inns, Hilton and DoubleTree hotels. 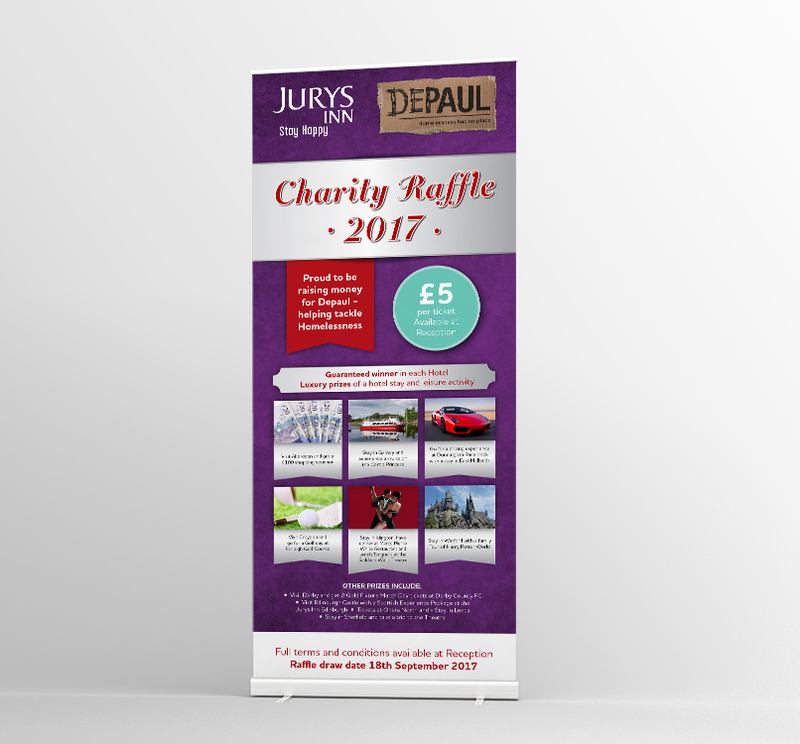 The customer came to us to provide the design and print services to promote a charity raffle that will be taking place throughout September in aid of the charity, Depaul. Depaul works to support people who are homeless and marginalised around the world. They currently operate in the UK, France, Ireland, Slovakia, Ukraine and USA. The raffle prizes all include an overnight stay and experience day in locations from Dublin to Aberdeen and London to Prague. The experience days include guided tours, race days, football games, delicious meals, boat trips, driving experiences, family day trips, relaxing weekend breaks and even includes a visit to Harry Potter world- all for a good cause. 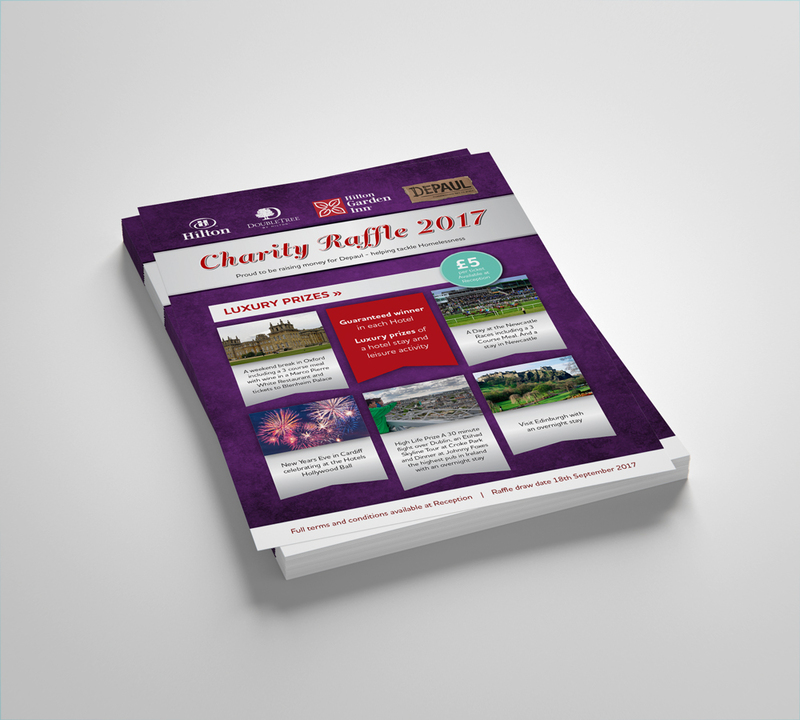 At Glasgow Creative, we designed and printed batches of A5 Leaflets using our Litho printing press which were distributed to various hotels across the UK to showcase the range of prizes on offer and raise awareness of the raffle. As well as the leaflets we also designed and printed 35 Roller Banners and raffle ticket books which were sent to each individual hotel for use. If you are in need of leaflets, roller banners or even raffle tickets for your business please do not hesitate to contact our team today and we would be happy to guide you through the process. You can even order online if you prefer! You can get in touch by emailing: info@glasgowcreative.co.uk | Call us on 0141 420 6800 or using our Live Chat option during business hours.